In the eight months since I became China's Vice Foreign Minister in charge of European affairs, I have paid nearly 10 visits to Europe. During each visit, I witnessed the tremendous efforts made by Europe to cope with the debt crisis, and I am very glad to see that some of these are gradually showing effect. China has provided firm support to Europe since the outbreak of the crisis. We contributed $43 billion to the IMF, and provided assistance to Europe through purchasing European treasury bonds and increasing imports. In my view, this is what we should do as the EU's comprehensive strategic partner. Next year, we will mark the 10th anniversary of the China-EU comprehensive strategic partnership. In spite of vicissitudes in the international landscape in the past decade, China-Europe relations have stayed on an upward track. There have been frequent exchanges between our leaders, leading to enhanced mutual understanding and trust. China-EU trade has quadrupled, and we have also maintained close consultation on climate change and other global issues. China is a staunch supporter of European integration. It is our consistent view that a united, stable and prosperous Europe is in the interest of the whole world, China included. When the European debt crisis was at its worst, some people propagated the idea of the "EU's disintegration". Yet China never changed its view, and remained confident about Europe's future. 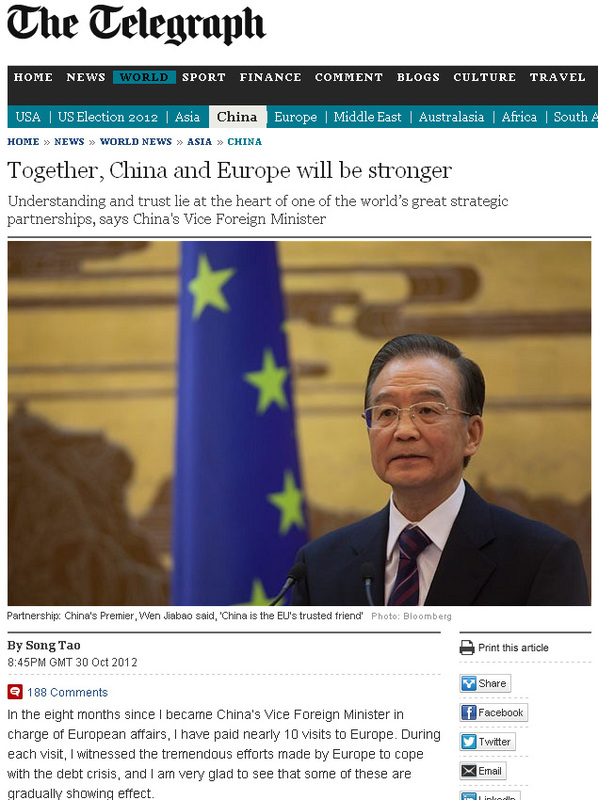 As Premier Wen Jiabao said, "China is the EU's trusted friend." As China moves to a high level in its development, the scope of co-operation between China and Europe will only become broader. There will be increasing demand in China for European products, technology and investment. We need to draw new plans for our co-operation in finance, urbanisation and sustainable development, and explore the possibility of establishing a China-EU free trade area. At the same time, we need properly to handle our differences and disputes according to the principle of mutual respect, and do all we can to translate the huge potential of co-operation into reality. A promising future of China-Europe relations requires our joint effort to uphold a peaceful and stable international environment. Both China and Europe went through the havoc of the Second World War and our people were the victims of wars. No one understands the preciousness of peace better than us. I know that some European friends are concerned over the Diaoyu Dao issue recently. Diaoyu Dao and its affiliated islands have been China's integral territory since ancient times, over which China has indisputable sovereignty. Japan stole Diaoyu Dao from China during the First Sino-Japanese War at the end of the 19th century. After the end of the Second World War, in accordance with the Cairo Declaration, the Potsdam Proclamation and other international legal documents, all the territories Japan had stolen from the Chinese were restored to China, including Diaoyu Dao. The current tensions over Diaoyu Dao were provoked solely by Japan. Last September, the Japanese government abandoned its previous agreement with China on setting aside the dispute and took the so-called nationalisation measures regarding Diaoyu Dao, which in essence are aimed at changing the islands' legal status. The Chinese side was left with no other choice but to respond. China has been committed to settling the dispute through dialogue and negotiation. It is imperative that the Japanese side correct its wrongdoings and return to the track of negotiated settlement. After the end of the Second World War, fascist crimes committed on the European continent were brought into full account. This paved the way for Europe's integration process and has turned Europe from a continent deep in war to one of peace. Regrettably, some political figures in Japan still insist on paying homage to the Yasukuni Shrine where war criminals are worshipped. In blatant denial of the crimes Japan committed during the war, they are trying to rewrite history, challenge the international order and undermine regional peace and stability. These moves should put all peace-loving countries and people on high alert. To safeguard the victory of the Second World War and the post-war international order remains an important and real issue in Asia today, and should be the shared responsibility of the whole international community. A peaceful and stable Asia-Pacific is in the interest of all parties in the world, including Europe. China will stay committed to the path of peaceful development and friendly co-operation with the people of all Asian countries. China and Europe are two important players in the world and each other's indispensable strategic partners for development. That is why China is ready to work with Europe to make an even greater contribution to world peace, stability and development.